FAYETTEVILLE, Ark. 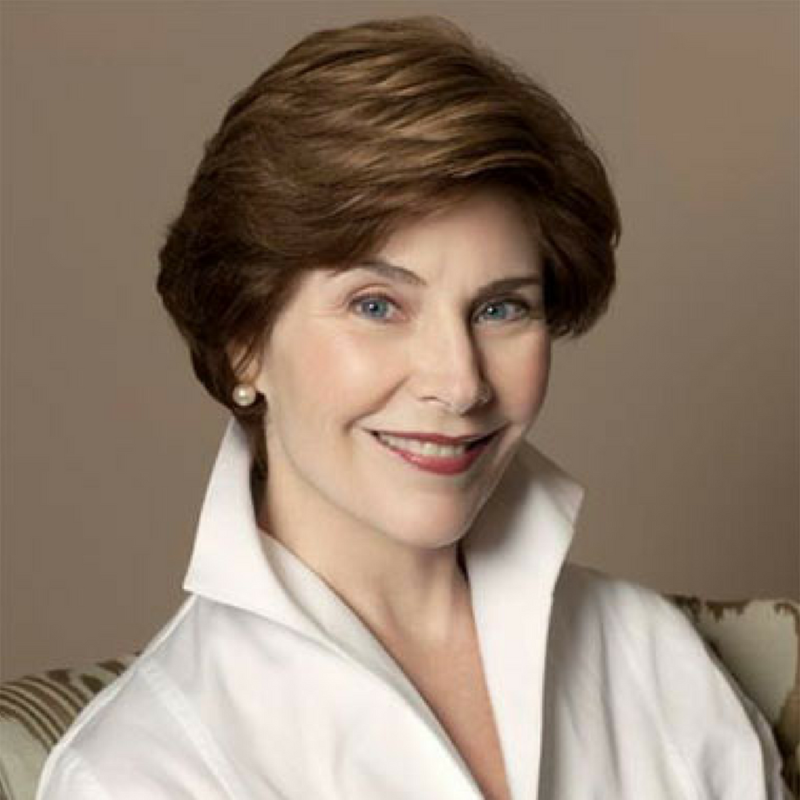 – Laura W. Bush, first lady of the United States (2001-09), will speak at 7 p.m. Thursday, April 18, in Bud Walton Arena as part of the University of Arkansas student sponsored Distinguished Lecture Series. As first lady, Mrs. Bush advanced literacy and education to support America’s young people. Today, as the Chair of the Woman’s Initiative at the George W. Bush Institute, she continues her work on global healthcare innovations, education reform, empowering women in emerging democracies and supporting the men and women who have served in America’s military. The event will be general seating, and tickets will not be issued. The lecture is open to the public but University of Arkansas students will be given preference. Doors will open at 6 p.m. for students and 6:15 for the general public. Each person entering the arena will be required to pass through a security checkpoint. Please note the “prohibited items” list below and allow extra time to accommodate security procedures. This event is sponsored by the Distinguished Lectures Committee through the Office of Student Activities and is supported by the Student Activities Fee. For questions or for accommodations due to disability please contact the Office of Student Activities, osa@uark.edu or call 479-575-5255. The Distinguished Lectures Committee is a program in the Division of Student Affairs. The Arkansas Razorback baseball team is hosting Mississippi State at Baum Stadium at 8 p.m. Meanwhile, the Razorback softball team will be playing against LSU in Bogle Park at 6 p.m.
People attending Mrs. Bush’s lecture are encouraged to park in Lot 56 at the corner of Razorback Road and Dr. Martin Luther King Jr. Boulevard, and limited parking for people with disabilities will be available in lot 60. Metered parking is available for $1.75/hour at the Stadium and Harmon Parking Garages. Shuttles will run from the Arkansas Union underpass and the Harmon Parking Garage (street level) to Bud Walton Arena and back. The University of Arkansas Police Department will be responsible for traffic flow and security at all of the evening’s events. Special security measures will be in place at Bud Walton Arena for the lecture. Each person entering the arena will be required to pass through a security checkpoint, and attendees should allow extra time for security procedures. Alcoholic beverages, baby seats/carriers/baby strollers, backpacks, bags of all types, except when used for medical or childcare needs, beach balls, inflatable toys or laser pointers, coolers, ice chests or thermal containers, explosives, guns, knives or weapons, folding chairs or stools, food and beverages, noisemakers of any type, personal heaters, signs and banners of any kind, tobacco of any kind including e-cigarettes, umbrellas, video cameras, selfie sticks, drones and pets. Bags in compliance with Clear Bag Policy / Clear Tote (plastic, vinyl, or pvc and no larger than 12” x 6” x 12”; logos no larger than 4.5” x 3.4” may be displayed on one side) OR plastic storage bags (no larger than 1 gallon, re-sealable, clear) plus a clutch purse (with or without a strap, no larger than 4.5” x 6.5”.) Cameras with 6” lens or less (no case); service dogs trained to aid patrons with a disability; carried rain gear, blankets or coats; wheelchairs and walkers for people with disabilities; and binoculars (no case).